I actually have written about these before. I'm revisiting this because my sister, Pat, up in beautiful Cherry Hill, NJ, the home of the water tower at Kresson Road, the Turnpike, and I-295 wanted to see them. Making bagels and pretzels are pretty simple. First, you make a dough. I normally use Pat's Pizza Dough for the pretzels and pretzel rolls. For bagels, I prefer a Challah recipe, which I have here. Don't forget the raisins, they're wonderful in this recipe. The trick is that you have to par-boil these beasts before you bake them normally. The parboiling will give the crust that you're looking for. To a large pot of water add 4 to 6 cups of water. For each cup of water, add 1 tablespoon of baking soda for pretzels or 1 tablespoon of molasses for bagels. Bring the pot of water to a boil. The water will boil quicker than usual and the additives will make quite a bit of foam on top that may not go away right off. So you will want to turn down the heat and stir until this stuff that looks like sea foam gets dispersed, mostly. Here's the problem with these pretzel rolls. If you want a "roll" texture, you want a nice fluffy well risen roll of dough. Start with 80 grams of dough, about 2 3/4 ounces. Allow it to rise fully - about two hours at a "normal room temperature". When you go to parboil your dough ball, it may deflate or fall. Boil each dough ball for 30 seconds per side, then remove it and place it on your cookie sheet to bake. How do you make sure you get a nice fluffy dough ball into the pot of boiling water? I have a lot of trouble with this one. The dough will stick to your cookie sheet since it has risen and pushed some of the corn meal out of the way. It will stick to baking parchment. It will stick to a silpat silicone sheet. If you flour the sheet, it will stick. If you cornmeal the sheet it will stick. If you try to remove the dough ball with a spatula, it will stick. It will stick to your fingers when you go to pull them up and it will stick to your fingers when you drop them into the boiling water. Don't burn your fingers. You have been warned. I simply have not found a way to reliably get the dough that has fully risen until it is about the size of a medium orange or a baseball into that water without it at least partially falling. If you look closely, really closely, at that picture, you'll notice that the rolls are all flattened somewhat. The traditional bagel and soft pretzels you are used to eating are not "fully risen", and I think it is a plot! Since you have to remove them from the sheet, you want to have them deflate as little as possible. Solution? Don't let them rise as much so the gluten hasn't stretched out. Partially risen dough will hold together better. So you get a chewier baked good as a result by not allowing it to rise quite as much. It will be denser as a result. These do taste good whether risen or not. In fact they're excellent with ham, sharp cheese, and a strong mustard, or just with cream cheese and cherry jelly. I'll work on that and let you know. 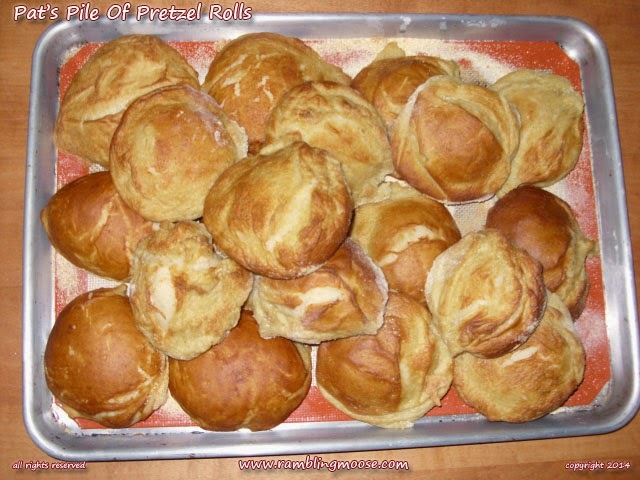 I may just have to accept defeat and not have really fluffy pretzel rolls. But next time, I'll try both flour and corn meal and really dust the daylights out of that cookie sheet!